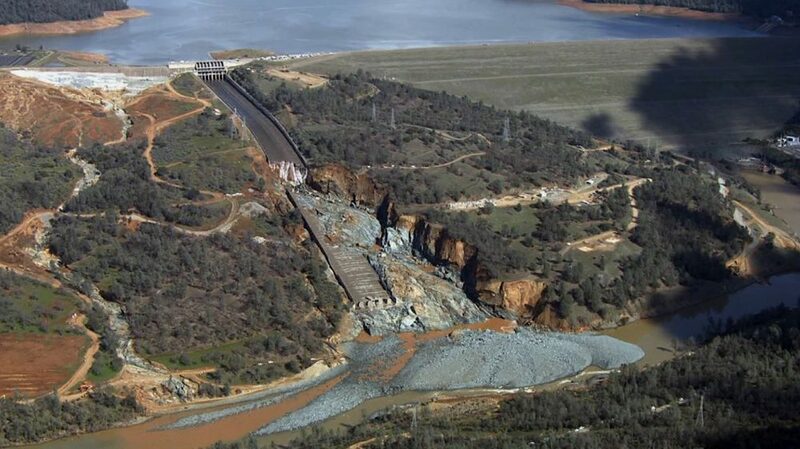 A Feb. 27, 2017 image of the Oroville Dam, the nation’s tallest, after heavy rainfall forced authorities to release water down a damaged spillway. The incident raised questions about California state spending on public infrastructure. Photo by KCRA/Associated Press. We have reached the high holy days of California’s budget season, as our governor and legislative leaders decide which programs will gain new life, and which will be sacrificed. And so our state government’s ministers have begun their ritual sermons on the dangers of overspending. They are preaching nonsense. California’s real problem is underspending. Go ahead and dismiss my claim as blasphemy. After so many years of budget crises and big deficits, Californians have adopted a budget theology grounded in self-flagellation, even though our recent budgets contain small surpluses. You can probably recite the catechism yourself: We’re still sinners who spend too much on state services! Far more than we take in! So save us, Non-Denominational Higher Power, from our profligate selves! Punish us with budget cuts or spending limits or a rainy day fund! I’m sorry, but what our spending religion really needs is reformation. And that requires genuine revelation. Our state’s tendency to produce big deficits is not caused by big spending. We have had big deficits because our state budget is based on volatile formulas that tend to expand deficits in unpredictable ways. In fact, California has long been on par with other states in expenditures per capita and in spending as a percentage of state GDP. Still, we cling to our budget religion and, fearing overspending, we take the cheaper path—which often costs the state more money in the long run. The problems of underspending are most obvious when it comes to pension obligations. California governments and employees have long spent too little money on contributions to pension funds, which are underfunded. So, to try to catch up to our pension obligations, California taxpayers are having to make much bigger contributions now. And those catch-up contributions are leading to even more underspending on critical services, as money that should go to schools or health care or infrastructure is used to cover pensions. The costliness of underspending is also the story behind rising public higher education costs in California. Over generations, the state has cut back its relative contribution to the University of California and California State University systems. This underspending has been made up for in part with ever-higher tuition fees for students. And, despite what you may read, the latest UC scandal is also about underspending; a state audit’s central allegation is that UC’s office of the president accumulated more than $100 million in funds that it wasn’t spending. That scandal reveals a hypocrisy in our budget religion; overspending may be the stated enemy, but underspending gets you into far more trouble. The state parks department kept a secret reserve of unspent funds that became a major scandal in 2012. In California’s prisons, underspending led to an intervention by the federal courts, which ordered the state to spend more on its unconstitutionally overcrowded prisons and reduce its prison population. Our state’s leaders understand the problem with underspending, but they haven’t been successful at explaining the problem, credibly, to the public. It also hasn’t helped that when state officials do need to spend big, they haven’t been very good at it. Underspending also explains problems with our basic services. Studies have found that the state spends tens of billions less on schools than would be necessary to provide all Californians with an adequate education. And that underspending has real costs: California is not producing enough college graduates and skilled workers. The state has made bold promises on child care and early childhood education that it hasn’t adequately funded, leaving citizens to pay for the rest. Child care now costs more than college tuition here. And housing costs more than just about anything, in part because we’ve spent so little on housing that we have a massive shortage, which forces Californians to pay housing prices more than twice the national average. That the state has failed for generations to spend enough to build and maintain infrastructure is obvious in the degraded condition of roads, bridges, and waterways. The state’s failure to create strong enough spillways at Oroville Dam is forcing California to make hundreds of millions of dollars’ worth of repairs and upgrades before the next rainy season. Our state’s leaders understand the problem with underspending, but they haven’t been successful at explaining the problem, credibly, to the public. It also hasn’t helped that when state officials do need to spend big, they haven’t been very good at it. Examples include the new Bay Bridge, with its delays, cost overruns, and questions about the integrity of its steel rods, and the high-speed rail project, where spending and construction has been so slow that many people think the project will die. In recent budgets, Gov. Jerry Brown and the legislature have sought to counter the state’s tendency to underspend now and pay later. They’ve made a great show of efforts to pay down debt. In his current budget proposal, Brown suggests making a large advance contribution to pensions now, in order to reduce liabilities later. But that payment, unfortunately, is achieved in a questionable manner: by borrowing billions from a state special fund. As Stanford lecturer and former Schwarzenegger advisor David Crane wrote recently, since pension contributions get invested, that payment amounts to a “leveraged bet” on a stock market that Governor Brown himself has warned is overdue for a correction. Brown has grown popular as a proselytizer of the credo that California can be managed on the cheap. That’s appealing dogma for a state whose people struggle with a very high cost of living. But the realities of our state should remind us that successfully running California on the cheap is a fantasy that has curdled into a costly article of faith. And we parishioners are being stuck with the tab. Primary Editor: Sarah Rothbard. Secondary Editor: Reed Johnson.